Amir Lehavot in Seat 5. Mark McLaughlin in Seat 6. If there’s anyone at the final table that doesn’t need an introduction, it’s JC Tran. 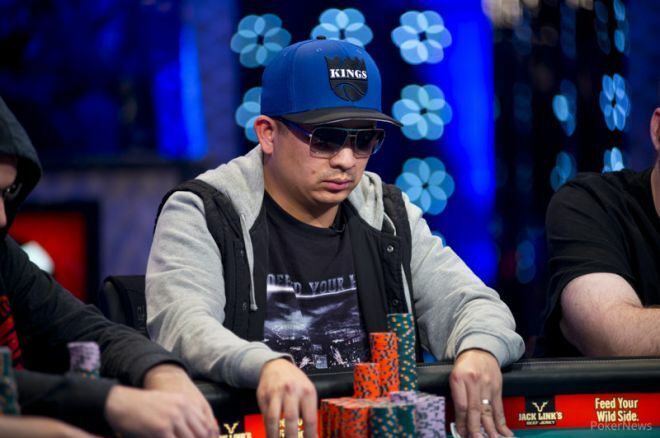 By far the most accomplished player in the November Nine with $9,041,483 in lifetime earnings, the 36-year-old Tran has two World Series of Poker bracelets to his credit—one in the 2008 WSOP Event #49 $1,500 No-Limit Hold’em for $631,170 and the other in the 2009 WSOP Event #30 $2,500 Pot-Limit Omaha for $235,685. In addition, Tran has one WSOP Circuit ring for his win in the 2004/2005 WSOPC Rio Las Vegas $1,500 No-Limit Hold’em event for $97,470. In addition to his WSOP success, many may recall Tran as a face of the World Poker Tour. In February of 2007, Tran finished runner-up to Eric Hershler in the L.A. Poker Classic Main Event for $1,177,010 (currently his biggest career score), and the one month later won the WPT $5,000 World Poker Challenge in Reno for $683,473. As if that year couldn’t get any better, Tran won the Doyle Brunson Five Diamond World Poker Classic $5,000 No Limit Hold’em in December for $523,075. While he's known best as a live pro, Tran also has a massive score on the virtual felt, capturing the PokerStars World Championship of Online Poker (WCOOP) Main Event in 2006 for $670,194. Tran was born on Jan. 20, 1977 in Vietnam but now resides in Sacramento, Calif., where his family immigrated to when he was just two years old. Tran is the youngest of eight children. He studied at California State University where he obtained a degree in Business Management Information Systems, and it was during his time in college that one of his brothers introduced him to poker on his 21st birthday. After graduating, Tran decided to pursue poker full time, and it's proved a wise and profitable decision. Tran will start the November Nine as the chip leader with 38 million, which is a solid 8 million in front of the next closest competitor. Surprisingly, Tran actually had the worst start to the Main Event out of the remaining nine. At one point he was down to just six and a half big blinds, but managed to fight back. At the end of Day 1c, Tran bagged just 33,100, a mere 3,100 more than the 30,000 starting stack, and over the next four days he slowly built that up to over 3 million. It was on Day 6 that Tran shifted gears and nearly tripled his stack before continuing to roll on Day 7. "I was down to 12,500 to be exact at 1,000/2,000 blinds," Tran explained to PokerNews. "I felt like, 'Wow, is this how my World Series is going to end?' I told myself just don’t give up. Fight. You can get your money in. there is a decent chance to double up and from there get a couple of double ups and be back to a good stack. What brought me back was king-jack and I told myself, 'look it happened and it could happen again; so be ready.' And you know what, it sure did." It was on the final day of play that he eliminated Fabian Ortiz (17th - $357,665), took the chip lead with a pair of fours, and then eliminated both Matthew Reed (11th - $573,204) and 2001 Main Event Champ Carlos Mortensen (10th - $573,204) to set the 2013 WSOP November Nine. Tran has a great seat at the final table with position on three of the other big stacks. On his left is the short stack, David Benefield, followed by Jay Farber, who could very well sit tight for a bit in an attempt to go deep in front of his hometown crowd. Toss in the other three short stacks behind him and Tran should have no trouble pushing around anyone he sees fit. The November Nine chip leader doesn't always win, but more times than not they tend to go really deep. Look for Tran to use his well of experience and chip advantage to do just that. Even though Tran is the chip leader, don't expect to see much of him between now and the November Nine. As he told PokerNews in an interview: "My wife has been absolutely amazing. She’s pregnant at the moment so her body is exhausted. Plus we have a two year old so things can get pretty hectic. She even wakes up to make me breakfast, prepare my coffee, drop me off, and meet me on dinner break. Right now she’s not feeling well but still trying to do things for me. I told her right now just rest and relax. Once this is over, it will be all family time for a long time. I might make one stop for that big $10 million guarantee (in Florida) but other than that I’m not going to Asia, not going to Europe, nothing. That will be it."